In 1866, young Conrad Swensberg opened the Grand Rapids Business College & Telegraphic Institute, the ancestor of today's Davenport University. Swensberg was eleven years old, in 1846, when his family left Germany to settle in Ohio. From Ohio the family moved to Iowa where Swensberg’s parents both died. Left to fend for himself, he abandoned farm life and went to work for the Iowa State Survey. Much of his education was gained by his own efforts, but after serving as a clerk on a Mississippi riverboat he entered Oberlin College. 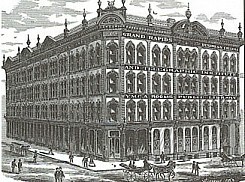 Swensberg arrived in Grand Rapids in January of 1866; by the 25th of that month he had opened the Grand Rapids Business College. Almost immediately he joined with James L. Robbins, and the school became the Grand Rapids Business College & Telegraphic Institute. This, the city’s first permanent commercial college, was initially located in the Luce Block at the corner of Monroe and Ottawa. The Grand Rapids Business College program was designed for enterprises that ranged from farms and country stores to banking, commission business, and wholesale trade. Their notice in the 1868 City Directory reported that they taught “business correspondence and the use of capital letters, in regard to which we find many deficient.” Commercial law and commercial arithmetic were included. A preparatory department taught German, English, French, Phonography (or Spelling), and the common English branches—meaning the preparatory courses normally taught. Michael E. Davenport took over leadership of the school in 1910. Swensberg’s 1866 Business College is the ancestor of Davenport University and its fifteen campuses throughout Michigan.